Thoughts on: FS7 v EVA1. 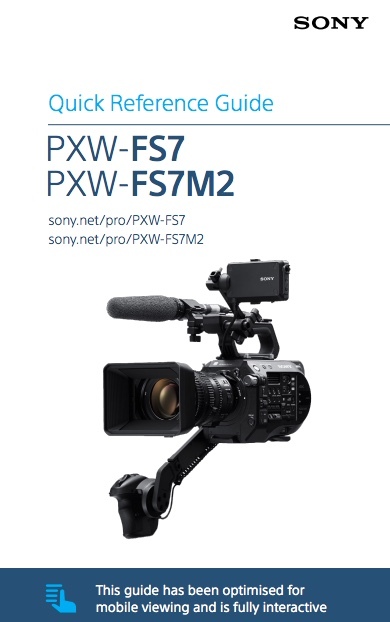 The PXW-FS7, Sony best selling pro video camera. I don’t like comparing two models directly and coming out with a one is better than the other conclusion. And I don’t want this to sound like a Sony fanboy put-down of the Panasonic EVA1. But I’ve had a lot of people ask me whether they should buy an FS7 or wait for the EVA1. First of all: I have a good relationship with Sony. I like Sony cameras, I’ve been using them for all of my career and they have served me very well, so yes, I am probably biased. Second: I haven’t shot with an EVA1, I have only seen highly compressed online clips and read the spec sheets, so I don’t really know how it performs. Very few people do. Third: We are at the limits of what can be extracted from a silicon based sensor. The underlying technology is the same whether you are Arri, Panasonic or Sony and there is a limit to the efficiency of silicon at converting light into electrons, dynamic range, noise etc. So really we won’t see any one camera appear on the market that is massively different to any other with a similar sized sensor, especially at similar price points. The FS7 is the most successful pro video camera Sony have ever produced by a big margin. There are thousands of FS7’s out in the field being used day-in, day-out to produce all kinds of TV and video productions. It is the industry standard camera for most large sensor TV and video productions. Most TV producers have heard of it, many specify it. I have even seen producers offered Red’s, F55’s or Alexa’s for the same rate as an FS7 but the producers insisted on the FS7 because it’s what they know, it’s what they are comfortable with. They know exactly what they are getting and how to handle the material. The FS7 is an incredibly versatile camera. It can shoot HD, UHD and 4K. It can record using XAVC and the XDCAM HD codec which is ingrained in television broadcasting world wide due to its low computing power requirements. At the same time it can (via an adapter) output raw for high end film style productions. It can shoot at up to 180fps in HD for slow motion as well as 4K 10bit 422 at 60fps for normal speed or off-speed applications. It’s approved by Netflix for 4K production. There isn’t much it can’t do. It isn’t perfect, no camera is, but it represents amazing bang for the bucks and it can make very pretty pictures. It uses professional grade recording media for reliability and speed. You can off-load your footage from the XQD cards incredibly quickly. The cards themselves are robust and reliable, there is no need to resort to parallel recording for safety. It just works as it should. If you have an FS7-II then you also have the wonderful variable ND filter and a locking E-Mount. The E-Mount is one of the biggest benefits of the FS7 over it’s competitors. Thanks to E-Mount you can use just about any lens you want as well as adapters such as speedboosters. Even the new high end Venice camera features an E-Mount because producers and directors want flexibility. Need to use the camera to shoot news? Stick on a B4 ENG zoom via an adapter. Want to shoot a movie? Use a Fujinon MK or use a true Cine lens with a PL adapter. On a budget, throw on some old Canon FD lenses or Canon EF lenses just by swapping the adapter. Whatever any other manufacturer (or even Sony themselves) produces, none of these things will change overnight. The camera will continue to perform just as well tomorrow, next week, next month, next year as it does today. Even if a substantially better camera comes out today it will take at least 6 months for that camera to become widely accepted and longer still for it to become an industry standard like the FS7. From an image quality point of view it’s unlikely that there will be a significantly better camera at this price point any time soon because of the limits of what can be done with current sensor technology. In terms of what the camera can do, what more would you like from the FS7? It’s already feature packed. If we take a look at what Sony have done with the new high end Venice camera you will see that if the sensor is used as a super 35mm sensor (like the FS7) it has the same pixel count as the FS7. Both are 4K at super 35mm. To get a higher resolution with Venice you have to take advantage of the larger full frame capabilities of the Venice sensor, this then gives you 6K’s worth of pixels. Why did Sony do this? why not just cram more pixels onto a super 35mm sensor? Pixel size is very important. It’s part of the reason why cameras with bigger sensors tend to produce better pictures. A bigger pixel can gather more photons of light, making it naturally more sensitive. A bigger pixel can also hold a larger electrical signal before it overflows, this allows for a bigger dynamic range. The color filters can also be bigger allowing for higher quality filters for better color accuracy and less pixel to pixel cross-talk. For Venice, Sony chose to keep the pixels as big as possible to get the best possible image quality with low noise and high dynamic range. 4K’s worth of pixels is plenty for most productions. It’s worth remembering that the Arri cameras are only 2.8K and most people seem happy with their image quality. The Panasonic EVA1 has more pixels than the FS7. This gives Panasonic an easy sales pitch advantage. The easy sell is the “big is better” sell. More pixels thus higher resolution is an easy sell, bigger numbers sound better. But cramming more pixels on to the same size of sensor means the pixels must be much smaller. How will the fact that the pixels are significantly smaller effect the image quality? Only time will tell. I’m sure the EVA1 will be a good camera but I suspect that Panasonic will be trading off a bit of sensitivity and dynamic range to gain a small resolution advantage, thank most people will really struggle to see. It’s a game of swings and roundabouts that every manufacturer plays. The FS7 is a well respected, very capable camera. It’s tried and tested. It has an incredibly flexible lens mount. One of the Canon C300’s restrictions and perhaps part of the reason why it sin’t as popular as the FS7 is the lens mount and the EVA1 shares those same restrictions. With no variable ND filter, when using most Canon lenses the aperture will go in steps making smooth mid shot exposure changes impossible. What do you do if you want to shoot in extremely low light? there’s no speed booster option. What do you do if you want to use a PL Mount cinema lens? Rent an FS7 perhaps? The EVA1’s planned recording rates max out at 400Mb/s (probably an SD card limitation, and I have big questions over the reliability of SD cards when pushed that hard). The FS7 reaches 600Mb/s when recording 4K 60p. The FS7 can record 4 channels of audio and has the great MI-Shoe system that allows you to power your radio mic receiver from the camera batteries. I love this system. I have the dual channel reciever so I can use 2 radio mics at once with ease. Plus I can also record a stereo atmos track at the same time. So, all in all, the FS7 still has a great feature set and it produces a great image. The FS7 viewfinder is great for those of us that can’t focus on an LCD screen just inches from our faces. The EVA1 is not suddenly going to oust the FS7 from it’s top spot. If I was looking for a new camera as a freelance operator right now the FS7 would still be my first choice. I want to be able to work today so I need a camera that will be asked for by producers today and for the foreseeable future. Panasonic are a bit late to this particular party. To make a big impact when you are late you need to have something very special (or very cheap) and while the EVA1 will probably be a perfectly good camera, I do’t think it is going to topple the FS7 from it’s current position as the go-to large sensor workhorse. Good news. Firmware version 3.0 has just been released for the PXW-FS7. This is a major update for the FS7 and adds some important new features such as a 2K center scan mode that can be used to allow you to use super16 lenses or more importantly eliminate aliasing and moire when shooting above 60fps. For users of the Cine-EI mode there are major improvements to the usability of the waveform display as this now works with most LUT combinations (but not in S&Q or when outputting 4K). In addition you can now enable noise reduction in Cine EI, although be aware that this may introduce banding artefacts in some situations. Zebras now go all the way down to 0% so if you want you can use zebras to measure white or grey cards when shooting log or to measure the recommended skin tone levels for S-log (40-55%) and hypergamma (55-60%) recordings. Also there is a proper time-lapse mode and some improvements to the quality of the raw recordings when using an external recorder raw such as the 7Q.